Almost all of my blog articles about Michigan driver’s license restoration deal with aspects of winning back your license. This article will be about how to avoid certain ignition interlock violations, or at least win a interlock violation hearing. In my role as a driver’s license appeal lawyer, I regularly handle ignition interlock violation cases. At least amongst my clients, the overwhelming majority of interlock violations are NOT the result of a person consuming alcohol. While there is a lot to this, the ultimate concern in any interlock violation, from a startup failure, positive breath test, missed rolling retest or a tamper/circumvent is that the person required to use the interlock has, in fact, been drinking. Especially when that’s not the case, an interlock violation is just a horrible thing to confront. Although there is no way to just “avoid” certain violations, there are steps you can take to make sure that you can prove you weren’t drinking. In theory, someone from your interlock company should have carefully explained all this to you at the time your unit was installed. In practice, it doesn’t always happen that way. We can belabor what was or what should have been until doomsday, but the bottom line is that if you’re reading this, you either want to know what to do, or you are looking back and wondering what you should have done. Most of what we’re going to examine has to do with startup failures, rolling retest violations, and plain old positive breath test readings. If you have a start up failure, positive breath test or a rolling retest violation, you need to keep testing to prove you weren’t drinking. In a startup failure situation, DO NOT just bail out of the car and come back an hour or more later to test. It looks like you were trying to time earlier drinking, saw you were positive, and then came back after you knew you’d test clean. The DAAD (the Michigan Secretary of State’s Driver Assessment and Appeal Division) doesn’t care if you have a meeting with the Queen of England and you’ll be late to get to it; it assumes that a positive test without a timely retest means you were drinking. This also holds true for a missed rolling retest. What the state “thinks” may sound crazy, but not nearly as crazy as being violated and having your license revoked all over again (this, confusingly, is called a “reinstatement” of the original action, meaning the revocation) and waiting nearly 8 weeks without a license for your hearing. If you miss a rolling retest, the state “thinks” you drank and then drove to pick someone up who could blow clean for you. Sure, that doesn’t sound likely, but when you miss a test, you have the burden of proving yourself clean by “clear and convincing evidence,” and the hearing officer is under the negative mandate to NOT grant your license back unless you meet that burden. This means you can’t slide by on a “common sense” argument, but must instead prove yourself innocent. This is important enough to repeat: You have the burden of proving that you didn’t drink. This is why your instructions on the order granting your restricted license clearly states that YOU are responsible for all failed and missed tests. The DAAD does not screw around with this stuff at all. Sometimes, it just doesn’t work out that you can get a timely PBT after a startup failure, a missed rolling retest, or a positive breath test result. If, for whatever reason, you cannot, or did not get a PBT at a local police station, you can still get what’s called an EtG urine test that shows goes back about 3 days to show you didn’t drink. You’ll have to call around to find a place that provides this service, but most district court probation departments use a local lab, so it shouldn’t be too hard to find a place, near wherever your located, to get that done. The point here is to have the evidence to prove that whatever happened, you weren’t drinking. It is almost always the case that you know you had a startup failure, a positive breath test, or a missed rolling retest. Unfortunately, most people don’t know that they’ve had a tamper/circumvent violation until it arrives in the mail. The most frustrating part of this situation is that most people have done everything they’ve been instructed to do when having work done on their vehicle, or they’ve taken every step imaginable to prevent a problem, only to wind up violated anyway. Even in these situations, there are steps that can sometimes be taken to prove you didn’t consume alcohol. Regrettably, they are all “after the fact” and are part of the legal preparation for a violation hearing. Sometimes a problem with the interlock doesn’t result in a violation. This can happen with up to 2 startup failures. Not getting violated is great in the short run, but those startup failures or positive breath tests MUST be adequately explained when you come back the next year to try and get your full license restored. If you stroll into a hearing without proof that you weren’t drinking, you risk, in a very real way, being stuck on the interlock for another year. Remember, under all circumstances, the hearing officer functions under rule 13 which provides that “The hearing officer shall not order that a license be issued to the petitioner [this also means “returned” to the petitioner in a violation hearing] unless the petitioner, by clear and convincing evidence, proves [that he or she is not guilty of the violation] all of the following…” This means that if there is ANY doubt as to whether a person is responsible for a prior startup failure, positive breath test, or any other problem with the interlock, the hearing officer will not grant a full license. As I noted, the DAAD doesn’t screw around with this stuff, so you shouldn’t, either. Beyond all the pitches and promises and other stuff lawyers put out about having proper legal representation, none of that will do you much good if you don’t take the appropriate action immediately upon having a startup failure, positive breath test or rolling retest violation. For all the money you can and probably will wind up spending on legal fees, take this free advice to the bank, because it will do more for you than all the lawyers in Michigan combined. 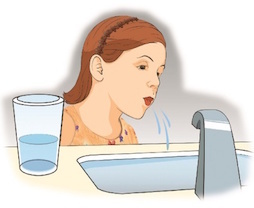 Rinse your mouth and retest; go to the police station and get a PBT, and if you miss that, go get an EtG urine test. DO NOT delay. Lawyers are great at planting “call me now!” pitches all over the place, but this is one statement with an exclamation point you should heed: Get a breath or EtG test right away! As you know, or will soon find out, all the tests in the world don’t prevent a violation from issuing if there has been a rolling retest failure, a tamper/circumvent or 3 startup failures. In that situation, you’ll need proper legal guidance, and that begins with taking the right steps, as outlined above, as soon as you find yourself facing one of the situations we have discussed in this article.